We would like to thank everyone who entered the competition! Unfortunately, there could only be two winners and they are: Joe Marty and Bruce Robertson. Emails have been sent out requesting shipping addresses. Once again Alien vs. Predator Galaxy is teaming up with Prodos Games to give our community a chance to win one of two sets of Prodos’ newly announced expansions for Aliens vs. Predator: The Hunt Begins miniature game! Up for grabs we have two sets of one lot of Evolved Warriors, the Specimen 6 promo and the Unicast Praetorian! Alien faction is still missing a lot of HQ class miniatures other than Alien Queen. On of the less royal “leaders” of Xenomorphs are Evolved Warriors. 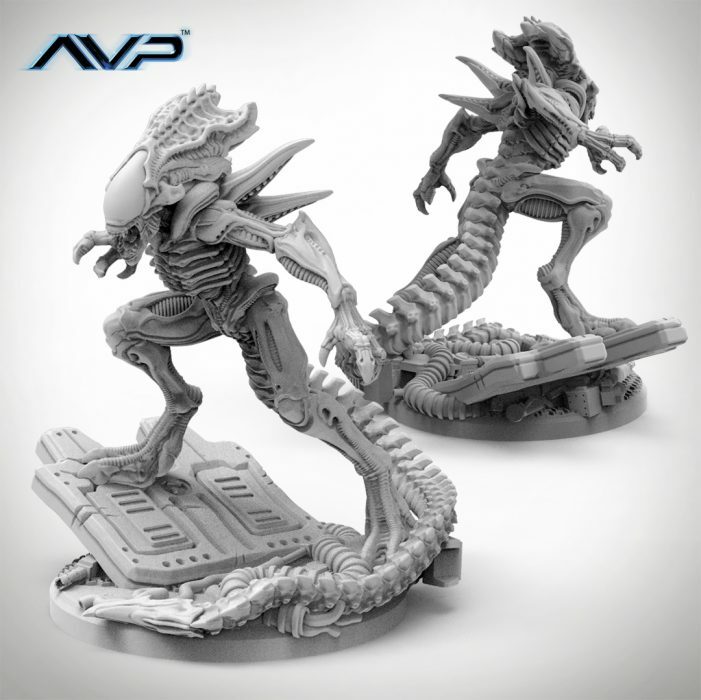 Inspired directly by Alien Vs Predator franchise they are now part of AvP Boardgame family as UniCast miniatures. And this month’s bonus miniature added to pre-order is also a very special Evolved Warrior, “Specimen 6”. Bot miniatures are directly inspired by video games in their poses and elements on the scenic bases. All you have to do to stand a chance at winning one of these 2 sets of awesome miniatures is answer the following the question. We want to know which scientist worked alongside Karl Weyland in Rebellion’s Aliens vs. Predator (2010) to conduct experiments on Specimen 6. Thanks again to our friends over at Prodos Games! If you’d like to learn more about the Aliens vs. Predator: The Hunt Begins then head on over to the their website and check out the game! Both Evolved Warrior and unicast Praetorian expansion are currently available for pre-order on the Prodos website for £20.00 each and are expected to ship on the 14th of August. The competition runs for one week and ends at midnight August 11th. AvP Galaxy Competition – Unicast Predator Hounds & Female Predators!